Eucalyptus sideroxylon is the red flowering variety of the Ironbark. Commonly called the Red Ironbark this is an adaptable tree that will reach 10 – 20m depending on soil and climate conditions. Wholesale growers of this and the Red flowering species for sale in a variety of sizes. This is the red flowering variety as the name suggests it will flower from autumn through to spring and grows naturally in eastern Australian states from Queensland to Victoria. A single trunk this is an upright tree with attractive thick bark which is deeply fissured. Eucalyptus sideroxylon forms an open rounded canopy is Frost hardy and relatively drought resistant. Pink to red flowers appear from winter through spring, appearing in clusters. A versatile tree in terms of soil conditions growing well in a wide range from sandy to clay soils, also reasonably tolerant of saline soils. Once established this is a hardy drought tolerant species, it will however also cope with wet winters as long as drainage is good. Requiring a well drained soil and a sunny position Eucalyptus sideroxylon makes an excellent specimen tree in a large park or garden and has been widely used as street tree and in avenue plantings. Deeply fissured reddish bark creates added interest. Upright when young but maturing to form a wide crown around 15m over time. Look for specimens with a strong central leader. 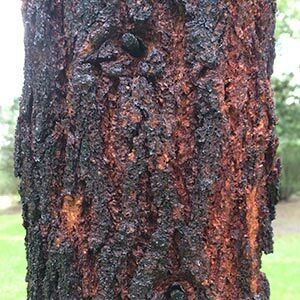 Eucalyptus sideroxylon or ‘Iron Bark’ Landscaping Uses. These are a very hardy and adaptable tree that are widely used in parks and gardens. Being reasonably small growing they are an excellent shade tree for a backyard and will also provide colour with the flowers. Used in street plantings as well as for a roadside screening plant. Eucalyptus sideroxylon – Red Iron bark, reaches around 10m in height, crown or around 5m and with red flowers. Eucalyptus sideroxylon rosea – Pink Iron bark, reaches around 8m in height crown of around 5m and with Pink to Red flowers.